Perry Ellis International, Inc. (PEI), fashion house for iconic menswear label Perry Ellis®, announced today the launch of Perry Ellis America®; a limited edition capsule collection of the brand’s famed sub-label, which first debuted in 1984. A homage to the original collection, PEI is exploring its archives to recreate some of its most recognizable Perry Ellis America pieces, while introducing new additions inspired by the bold logos and vibrant colors of the ’90s. From prep to grunge, to logos and back, fashion guru Perry Ellis (Mr. Ellis) defined American fashion for generations. In 1984 – in partnership with Levi’s – Mr. Ellis launched Perry Ellis America, the very first clothing collaboration of its kind. The collection fused luxury fashion with everyday classics to create a fresh, unique direction in American sportswear; a concept that would be imitated but never duplicated. PEI will once again take American sportswear into new territory with the introduction of Perry Ellis America. The unisex collection will revisit the fashion history Mr. Ellis helped to create, by bringing ’90s streetwear staples back for a limited time for enthusiasts around the world. The first of five Perry Ellis America capsules will drop on October 10 at Matches Fashion, followed by a global rollout with retail partners including HBX, Bloomingdale’s, and Ron Robinson at Fred Segal. The collection will also be available at the brand new www.PerryEllisAmerica.com. 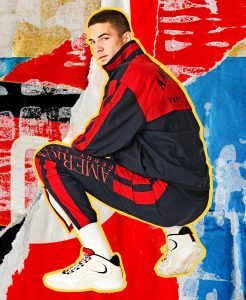 Perry Ellis America will launch with an evocative new campaign entitled “The New America,” that was developed in collaboration with Hypebeast, and features a diverse group of young, stylish influencers including athlete and model, Cordell Broadus. Broadus and the other influencers in the campaign reflect the youth of today’s America – a group that is not held back by past conceptions of race, gender or religion. They are worldly and diverse – finding their way by creating new opportunities for themselves in fashion, music and art. They combine international inspiration with American heritage to create a style that blends references of both old and new into a fresh contemporary aesthetic. They are the ultimate expression of the New America. The campaign will live on www.Hypebeast.com as well as all PEI social and digital channels.